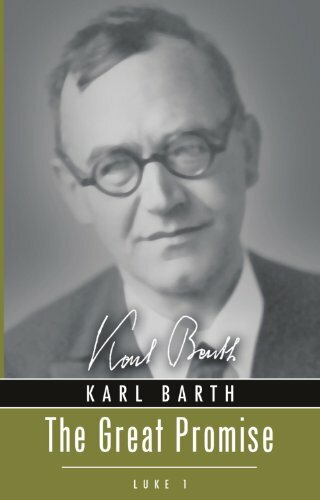 I am still reading Karl Barth's The Great Promise. I wanted to share some more highlight quotes as well as provide some interaction. I don't have too much to add though. Many are unaware that Karl Barth distinguished himself from other theologians by providing detailed exegesis in his lectures. One of the things that also set him apart was how his exegetical goal was always a message for the church. The Great Promise is such a set of lectures. The hermeneutical method of Karl Barth may not be common to modern conservatives. The value in his insights should be obvious. John will have the spirit of Elijah to turn the hearts of the people in readiness for Jesus Christ. This requires conversion from disobedience to "wisdom of the just." It is both from foolishness to wisdom as well as unjust to just. The church is not a "unity at any cost." It cannot cost these two elements. For someone as ecumenically minded as Karl Barth, this is a fun statement. Unless disobedience and foolishness are given up there is a false unity. It may be a unity of people but not the people of the Lord. The accusation this holds over the institutional church is staggering. The promise this entails for the church of Jesus Christ is staggering. Speech without faith is merely muttering. In the case of Zachariah, it is muteness. With these words, Barth reminds us of why he should not be considered a liberal theologian. Faith for Barth comes from an encounter with God. It is not a mere assent to doctrinal dogma. Faith is apart from "dogmatics and ethics" in so far as one can pronounce the latter without the former. There is an element in which one must encounter the risen Christ to perform theology and speak. Instead, the more eloquent the faithless speech the more evidently mute it is regarding the proclamation of Jesus Christ. I will admit that I was surprised to read this from Barth. On the surface, this seems like some psycho-babble meant to keep people happy and satisfied with themselves. Perhaps it really is. The crucial point for Barth is "who God is." "God is God" is irrelevant without knowledge of who God is and what He does. This is something evangelicals principally do not understand. The historical gospel narrative of Jesus' death, burial, and resurrection is a beautiful thing. But if God remains there in the past then the church has returned to deism. Barth correctly argues that only knowing God as the one who is concerned with us here is the true God of Scripture. There is an existential reality to the Christian faith. The disciples encounter Jesus Christ in the flesh and testified. So also the church experiences the resurrected Lord. In this experience, the fullness of God's gospel is known. God is known in the resurrected Messiah.